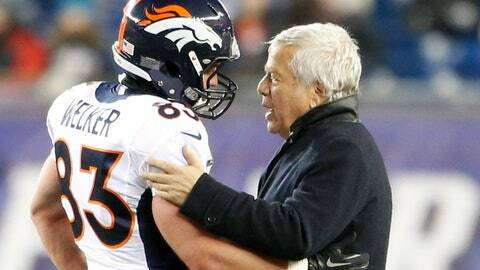 What led to the departure of Wes Welker (pictured with Patriots owner Bob Kraft last season) from New England? Wes Welker might still be in New England right now if his agent hadn’t pushed the wide receiver to test the free-agent market, Patriots president Jonathan Kraft told reporters Saturday. Kraft, son of owner Bob Kraft, said the Patriots made Welker a sizable offer before he hit free agency, but Welker’s agent turned the offer down. The younger Kraft contends that it was only when Welker wouldn’t play ball that the team turned its attention to adding Danny Amendola. "We still offered Wes before free agency started, more than he ended up getting in the open market," Kraft said, via the Boston Globe. "But once free agency started, we went out and signed Danny because he fit a construct that worked within our system, and we couldn’t take the risk of losing both Wes and Danny. So it really wasn’t as much about the money, it was about trying to do a deal with Wes before free agency started. His agent had a view of the world that we didn’t think was realistic." Welker is headed into the second year of a two-year, $12 million contract with the Denver Broncos, after making $9.5 million on the franchise tag in his final year in New England. Kraft said that, had Welker stayed in New England, he would have fared better financially in the long run. "We had actually offered Wes a deal the summer before that on a three-year basis would’ve left him in a financially better place than what he’s gonna end up having been in over those three years," Kraft said. For more sports coverage on and off the field, go to NESN.